SATURDAY DAY – Out & About on your own! Enjoy the pool at the host hotel, the sites of downtown Albany and the many fine eateries. Whatever you decide to do during the day, don’t get too spent because you don’t wanna miss the Saturday night party at ROCKS. ROCKS has a great Brunch menu planned featuring David’s famous corned beef hash - 11a – 2p, fixed price. ROCKS famous Tea Dance 4p-8p is having a DISCO Tea with a Back Deck BBQ and our Mason Jar $4 Long Island Iced Teas!! Plenty of local parades to salute those in uniform who have and do sacrifice everything to protect us! ROCKS opens at 2p with a special Memorial Day Happy Hour from 2p-9p and more free grilled meats!! 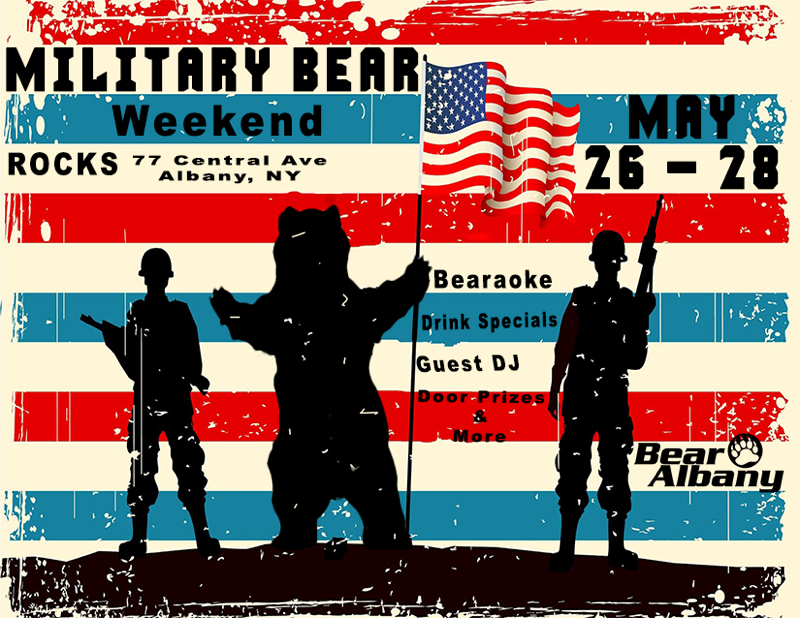 Be sure to mention you're part of the “BEAR ALBANY group” to get the discounted rate and book early as the discounted room block almost always sell out. Once you're out at the bar event, ask one of the BEAR ALBANY folks about the hospitality suite for complimentary refreshments and fun when the bar party is over. Albany will be getting ride sharing in the coming months, but in the meantime, BEAR ALBANY recommends cabbing or driving responsibly to and from the event venue. The hotel is also on the local bus line. I'm fond of your sharing. Your posts are exactly what I am looking for. I can make use of them when I'm in trouble. Thank you for uploading posts. It's good if you upload articles frequently.